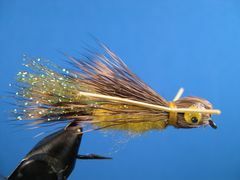 The Crystal Hopper is an ideal warmwater pattern. 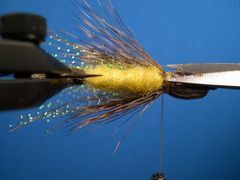 It has a blunt head that doesn't make a wake when it's manipulated, moving parts that add lifelike appeal, and Krystal Flash in the wing that works its magic on this fly just like it does on a host of other great patterns. 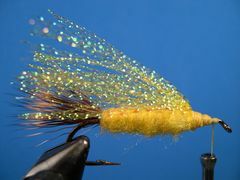 The Crystal Hopper in the tying sequence has a yellow body and wing along with a natural deer hair tail, skirt, and head. Another version that is just as effective on bass has an olive body, pearl Krystal flash wing, and an olive deer hair tail, skirt, and head. You may have to practice tying the reverse-tied deer hair head a couple of times to get the proportion of the head and the skirt right. If it's not right on the first try, unwind the thread, remove the deer hair, and try again. You'll get the hang of it with just a couple of trys. I like to use old fashioned flat rubber legs for the Crystal Hopper, but use any legging material that suits you. When grasshoppers land on the water, they occasionally kick their legs in an attempt to become airborne again but they don't swim so you shouldn't swim them with a stripping retrieve. If you're fishing lakes or ponds, let the lure set for a few seconds before you begin to minipulate it. 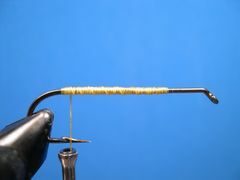 Then jiggle the rod tip to impart a struggling motion to the fly but don't move it. Let it rest for a few moments and repeat the process. Take your time. Patience is a virtue. It could be several moments before a big bluegill or a bass hits it. If you're fishing it in moving water, cast up and across the stream, make it hit the water with a splat, and then fish it with a dead drift without any drag. Insert the hook in the vice and crimp the barb. 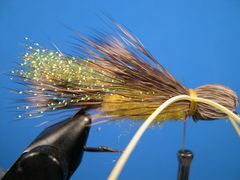 Start the thread about one-quarter inch behind the hook's eye and wrap the shank with thread back to the hook's bend. Cut a clump of hair from the deer hair hide, comb out the underfur, and even the tips in a hair stacker. 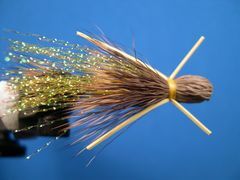 To make the tail, trim the deer hair butts and tie in the tips as shown. Cut a strip of 1/16th inch foam sheet that is 1/8th inch wide and make a tip on one end. Tie the foam strip in at the base of the tail by the tip. Wrap the foam forward as shown and bind in down. Don't crowd the space where the head will be. Spiral the thread back to the tail with light wraps of thread. You don't want to compress the foam any more than necessary. Compressed foam doesn't float well. Dub a noodle of Antron Dubbing on the thread and dub over the foam underbody. Don't crowd the area where the head will be. Select about a dozen strands of Krystal Flash, fold it, and cut it into two bunches of equal length. Put the two bunches together to form one bunch. 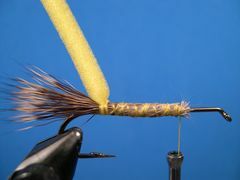 Tie the Krystal Flash in at the base of the body with the tips of the flash extendning slightly beyond the tail. Fold the flash over itself and bind it down with several wraps of thread. Trim the flash so it's even. Clip a substantial bunch of deer hair from the hide, comb out the underfur, and even the tips in a hair stacker. 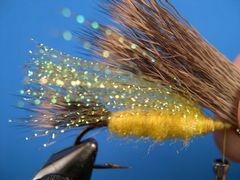 Measure it against the fly so that the deer hair bunch is equal in lenght to the distance between the hook's eye and the hook's bend. Trim the butts in preparation for tying it in. 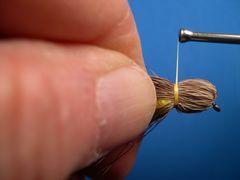 With the thread hanging slightly behind the hook's eye, align the butts of the hair with the front of the wing and tie the deer hair in as shown with the tips pointing forward. 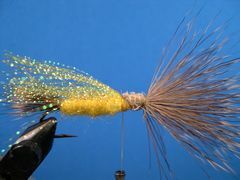 Be sure that the hair completely surrounds the hook and the butts are bound down. The thread should be hanging directly in front of the Krystal Flash wing. 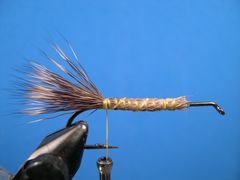 Stroke the deer hair tips back with a three-finger pullback to form the head. Take a several tight turns of thread to bind the hair to the hook. Trim the deer hair tips to expose the Hopper's belly. Tie in a strand of rubber legging material Madam X style on the far side and the near side of the hopper to form the legs. Move the thread in front of the Legs and take a couple wraps of thread. 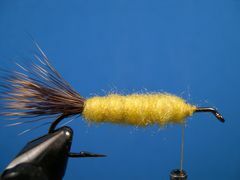 Then coat about an inch of thread nearest the fly with Zap-A-Gap in preparation to tie of the fly with a Zap-A-Gap Knot. 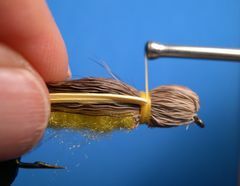 Pull the legs back as shown and take three or four wraps of the wet thread. The glue will dry almost instantly. Remove the thread. Trim the legs so that they end up looking like the legs in the photo. The front legs should extend slightly beyond the front of the head and the back legs should extend slightly beyond the hook's bend. Paint the head with Dave's Flexament thinned almost to the consistency of water. 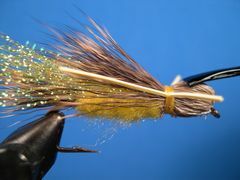 This seals the head so that the bug floats better and also provides a foundation for attaching the eyes. Select the smallest Yellow Doll Eyes that you can find. Put a small amount of Household Goop on the back of each eye with a toothpick and stick on the eyes. Your Crystal Hopper is finished.